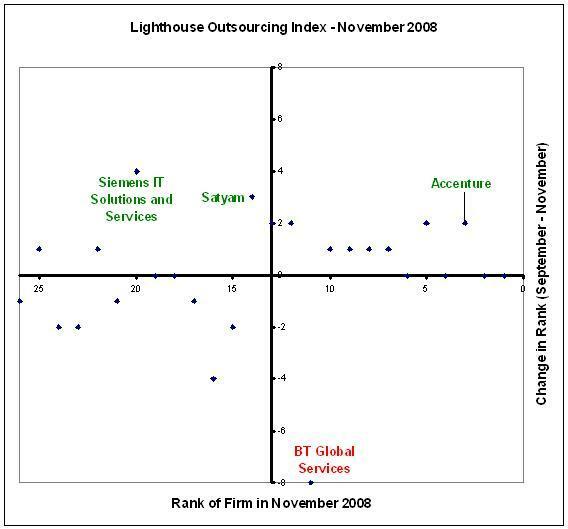 Accenture is the star of this month’s Lighthouse Outsourcing Index. The firm has been been named the second-most-admired company in contract management by the International Association for Contract & Commercial Management (IACCM) and focus on its UK business by IDC has helped it to gain 11% analyst focus and move up 2 positions. The firm is now ranked at the 3rd spot this month. Siemens IT Solutions and Services has also done well in this edition of the Outsourcing Index. The firm has improved its score by 79% and has moved up 4 spots. It has also announced that its North American Global Production Centers have achieved a triple crown of ISO certification and appears well positioned to move up in the coming months. Satyam has also improved its position this month as analyst focus on its growth in Europe. The firm is up 3 positions and is ranked 14th this month. BT Global Services is the biggest loser this month. The firm has dropped 8 positions and has lost 51% of its score compared to September 2008. BT has admitted that the profitability of its Global Services business unit, which was once considered BT’s engine of growth, are not up to scratch. Hopefully the appointment of a new CEO will bring back its focus and profitability.